MVD is a Super Smash Bros. Ultimate Snake player from Manhattan, New York, who is currently residing in Norman, Oklahoma. He is considered to be the best Snake in the world. In Super Smash Bros. for Wii U, MVD was a Diddy Kong player, and was considered one of the best Diddy Kong players in the world after ZeRo's retirement (along with Zinoto). MVD is ranked 1st on the South Florida Smash 4 Power Rankings and 31st on the Panda Global Rankings 100. He has taken sets off of top players such as Nairo, Salem, Tweek, Mr.R, Cosmos, WaDi, Ally, Abadango, CaptainZack, Marss, ANTi, and ESAM. In Super Smash Bros. Brawl, MVD is a Snake player, and is considered the best Snake player in the United States. MVD is currently ranked 6th on the 2016-2017 SSBBRank and was ranked 1st on the final Florida Brawl Power Rankings (right below ESAM, who held the 0 spot). MVD regularly teams with ESAM in Doubles, and the pair are considered one of the best Doubles teams in the world. On June 24th, 2015, alongside ESAM and SS, MVD was signed by Panda Global. MVD left Panda Global on January 4th, 2019, with Don't Park On The Grass 2018 being his last tournament with the team. On January 30th, 2019, MVD was signed by World Best Gaming. He is known for defending Lylat Cruise as a stage, popularizing the phrase "Lylat is beautiful and perfect" in Twitter, which he posts almost in a daily basis as a response to the stage's mixed reception. During Brawl's lifetime, he was also known for popularizing the hashtag "#SnakeSucks", which he used on several Facebook statuses, even those unrelated to Smash. His heavy and creative usage of Rocketbarrel Boost at CEO 2015 earned him the title of "The Barrel Technician". 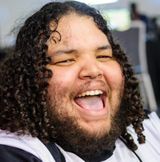 MVD was an employee at Arcade Odyssey, where he participates at local smash tournaments held at the arcade, and is currently known as the face of the arcade. ↑ Learn About Panda Global Gaming!. ↑ Farewell MVD, RayRay and Wobbles. ↑ World Best Gaming signs MVD. This page was last edited on March 30, 2019, at 23:20.